payroll reporting across your contractors. -ministration through a single platform which is available 24/7. logins, as well as detailed reporting across all your contractors. your company, so it is your brand that grows, not ours. Enquire about Online Timesheets & Payroll. We stand by our promises with outstanding client service. Payroll is made simple with Oncore’s online portal, with your approvers and managers having 24/7 access to the payroll and timesheet reporting of all their contractors. To ensure that your contractors are paid regularly and on time, Oncore also has the ability to provide funding to protect your cashflow, allowing you to effectively scale the growth of your agency without concerns about cash management. 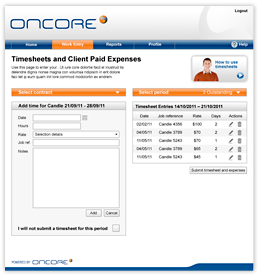 Every contractor has access to the Oncore customer portal and online timesheet system to enter time worked and expenses, and to view payroll information and update personal and invoicing details as required.